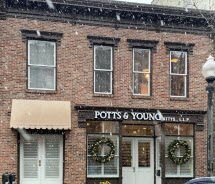 Florence’s oldest law firm, Potts & Young Attorneys, L.L.P., was established in 1939 by the father of the current managing partner, Frank B. Potts. Northwest Alabama and the Shoals area have a valuable resource in this distinguished law practice. The firm has achieved national recognition for litigation success in some noteworthy cases, and has obtained the coveted Martindale Hubbell “AV” Rating for preeminent legal ability and ethical practices. The firm was founded upon the underlying principle of treating all clients just as the lawyers themselves would want to be treated, and the firm continues applying this philosophy to all of its purpose-driven endeavors. Potts & Young features a committed team of lawyers covering a diverse and complementary set of practice areas: Personal Injury, Wrongful Death, Motor Vehicle Accidents, Social Security Disability, Criminal Defense, Family Law and Estate and Probate Law. Strengths of the law firm include a good rapport with clients and effective negotiation skills that have achieved many exceptional results. Whether "the other side" is an insurance company, a prosecutor, a government agency or a court system, lawyers of the firm apply well-honed communication skills and a solid foundation of legal knowledge in pursuit of clients' critical goals. The firm's history in Northwest Alabama and throughout the state spans generations, and many clients are personal friends, neighbors and colleagues. Attorneys at the firm experience clients' losses as affecting valued fellow community members. This perspective adds valuable empathy and compassion for the injured along with zealous representation in personal injury claims and other litigation. Social Security Disability attorneys at Potts & Young, L.L.P., apply an individualized approach to appeals for disabled people whose claims have been denied. Consultations on personal injury and Social Security Disability cases are free. Criminal defense lawyers at the law firm often put their own security on the line for the sake of protection of clients' constitutional rights. Even fighting prominent and powerful opponents, attorneys at Potts & Young, L.L.P., stand up for what is right, steadfastly pursue justice and the accused's rights to a fair trial. In family law and estate planning cases, clients can count on cost-effective, honest counsel and representation as they seek equitable divorces, child custody solutions with children's best interests at the forefront, and testamentary and other legal documents that assure the client’s wishes are followed in critical incapacitating situations and after death to avoid family uncertainty and conflict. Potts & Young Attorneys, L.L.P., has two attorneys, Frank B. Potts, and Debra Coble, who clerked for distinguished justices on the Alabama Supreme Court and Arizona Supreme Court respectively. The firm also has successfully handled numerous appeals in Alabama appellate courts, and many of their Alabama Supreme Court cases have defined the law as it still stands today.